Sometimes people feel purposeless in their lives. Their body feels hollow without the spiritual connection. They desire to discover something great inside them. This is the right place for them. Here are some straightforward techniques by which finding the inner self, becomes easier. 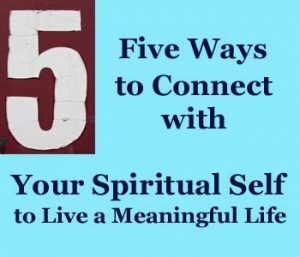 Just follow these five ways and connect with the spiritual self to live a meaningful life. You can only connect with its spiritual self if they genuinely intend to do so. The first step is to acknowledge the spiritual self and instill a desire to connect with it. When the heart begins to yearn for the inner self, and become curious about it, then the doors to the world of spirituality will open, and the path will become clear. So it is the intention, which determine the success and helps find the meaning of life. You must prepare before embarking on this journey. Feed your curiosity by reading good books, subjects that you are drawn to. Sink into the world of knowledge. By becoming inquisitive and opening the mind to a world of new possibilities, only then spiritual transformation begins. Your mindset changes, you gain a greater perspective, becoming aware of an always present inner self. So, for spirituality, you gain more knowledge which helps to find answers about the purpose of life! To connect with the soul, first love your body. Take care of the body by eating a healthy diet and sleeping well. Practicing yoga and being relaxed by preventing over-working can also help. As the mind, spirit, and body are connected, so when a person starts looking after their body and nourishes it well, they also become stronger spiritually. With a healthier body, spirituality becomes easy to express! Meditation is one of the simplest ways to connect with the inner self. Relax your mind. Take a brief mental break from your hectic everyday life. Even 5 minutes a day of quiet introspection yields an abundance of perspective and peace of mind. With the mundane thoughts of your day-to-day life set aside, a new awareness emerges. Suddenly the ‘inner slef’ is present with your conscious mind. Regular meditation accelerates spiritual growth, creates self confidence, assists you in staying on-track Yes, meditating every day helps find the purpose of your life! The best thing about the spiritual journey is that it has no rules or limits. You can keep on experimenting with ideas and beliefs and discover something new about themselves every day. There are no set prescriptions or instructions you have to follow. Just following your heart, do things that fuel your interest, and enriches your soul with passion and desire! Trusting your gut and following your instincts frees the spiritual self and helps find the meaning of life! Embark on this spiritual journey help to find the true purpose of life. Not hesitating and jumping on the bandwagon leads to a world full of possibilities! This inspiring journey helps a person find out a self, hidden underneath all these outer layers and enable them to look beyond the vision of eyes!